See in Glossary folder. Unity will then automatically import it. Supported Font formats are TrueType Fonts (.ttf files) and OpenType Fonts (.otf files). 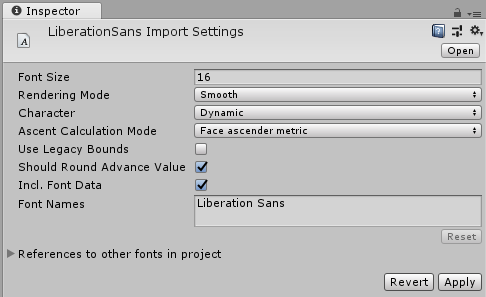 See in Glossary mode, which tells Unity how to apply smoothing to the glyphs. See in Glossary assets are 3d geometry textured with these auto-generated font textures. You will want to vary the size of the font to make these assets look crisp. Tracking can be set to modify how close each character will be to the next character on the same line and Line spacing can be set to define how close each line will be to the next. Advance will be the desired horizontal distance from the origin of this character to the origin of the next character in pixels. It is multiplied by Tracking when calculating the actual distance. See in Glossary field in the Inspector. See in Glossary. You have to save your scripts with UTF–16 encoding. 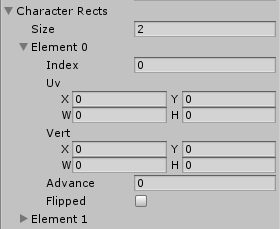 Now you can add unicode characters to a string in your script and they will display as expected in UnityGUI, a GUIText, or a Text Mesh. See in Glossary for the font. 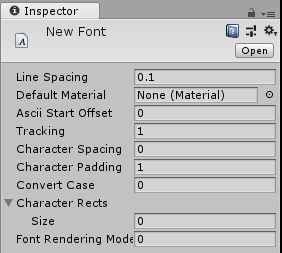 In the Project View, click on Create > Material, and select and set up the newly created Material in the Inspector. Make sure you assign the texture from the font asset to the material. If you use the built-in GUI/Text Shader shader for the font material, you can choose the color in the Text Color property of the material.